Hello friends of Andenkinder e.V. Thank you to everyone, who participating in "X-mas presents"
They are arrived almost 60 boxes and the kids were very happy about. It was a great Day for everyone who was available. Before we started unpack the packets we had enjoy our for everybody organized big Meal. 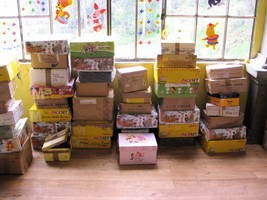 Here you will find some pictures from the event to give out the boxes. Surely that you are going to find your packet there, too.